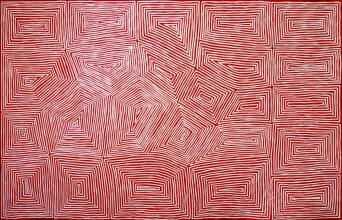 Subjects and Themes(Dreaming): Tingari Cycle. The mysterious "Tingari" is a creation myth that refers to a group of ancestral elders who embarked upon periodic epic journeys through vast tracts of the Gibson/Western Deserts. As they travelled, they performed sacred and mystical rituals which opened up new land. 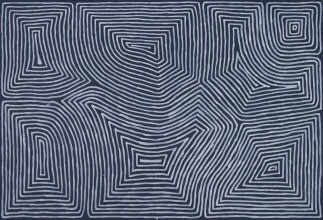 The adventures of these Tingari groups are enshrined in numerous song and painting cycles which still inform the Pintupi people today. With no written language, the songs and paintings of the Tingari Cycle form an integral part of the "passing down" of the ancient laws, Dreamings and Culture to the next generation of initiates known as the Punyunyu. 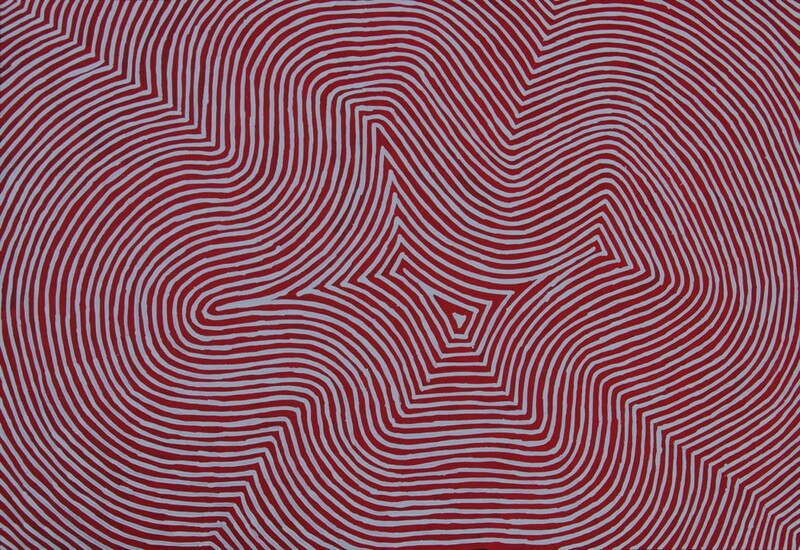 The Pintupi were a nomadic people who wandered over incredible distances from west of Lake MacKay in Western Australia to just east of Kintore in the Northern Territory. Their very survival depended upon their intimate knowledge of the land and the exact position of the next underground waterhole. 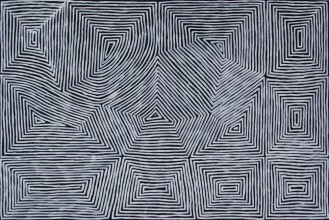 The remarkable paintings of the Pintupi are in effect aerial view landscapes sometimes on a scale that reflects the vastness of their Country. These paintings map not only the physical landscape, but also the spiritual element and how the two interact. Indeed, the Pintupi lands are so remote that only as recently as 1984, a family group of nine Pintupi speakers walked out the desert into the small community at Kiwirrkura just inside the Western Australian border. These people had lived undetected and completely unaware of Western Culture. When they walked into the 20th Century, they brought with them intact Dreamings and lore that stretched back tens of thousands of years. The painting depicts sacred sites associated with the Tingari Cycle. They are situated along the early journey paths of the Tingari Ancestors. 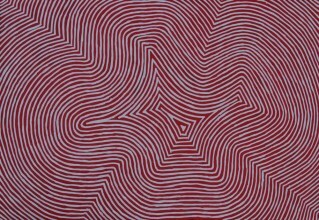 The Tingari Ancestors shaped and impacted on the landscape of Jake's homelands.